These two locomotives are also featured on the 'Argentina' page, where their complete history is covered - the entry here only relates to their time in Ceylon. During the 1930's the Indian State Railways were looking at testing diesel locomotives for possible use on some of their longer distance routes which ran through areas with little or no rainfall and extremes of temperature. 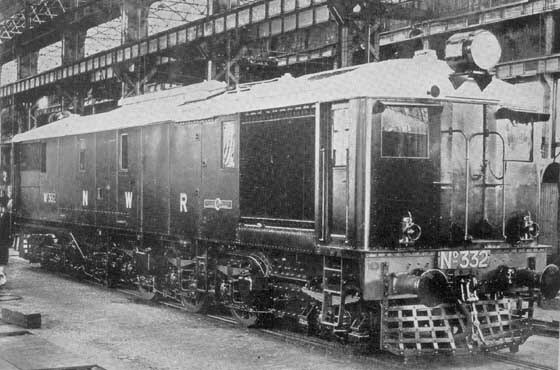 This was shortly after the introduction of AW's 'Universal Locomotive' (UL) and its successful trials. From these talks Armstrong Whitworth set about building two UL type locomotives designed for the Indian State Railways loading gauge. Unfortunately when the order was received it was for two much more powerful locomotives, 1,200hp as against the UL of 880/800hp. The two locomotives (D27 & D28) constructed were completed in the hope of finding a buyer for them. 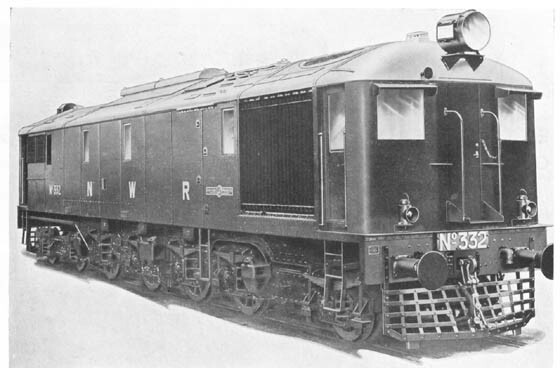 They were very similar to the UL locomotive, powered by an Armstrong-Sulzer 8LD28 engine producing 800hp at 700rpm, Laurence, Scott and Electromotors supplied the main generator whilst the three nose suspended, axle hung, force ventilated traction motors were from Crompton Parkinson. An Armstrong-Sauer six cylinder auxiliary engine was fitted, but this was now located in the engine compartment rather than in the nose as found in the UL. The wheel arrangement remained 1-C-1. They had been built as mixed traffic locomotives, with the ability to operate up to 1,000 miles before refuelling and in conditions of tropical humidity and shade temperatures up to 120F. After completion a six month trial was arranged for both locomotives with the Ceylon Government Railways, with the pair arriving in Ceylon in February 1935. Here they were renumbered 800 (D27) and 801 (D28). Primarily the locomotives were used on the Colombo - Talaimanar route, working the Indian mail trains which loaded to eighteen bogie coaches totalling about 500 tons. The pier at Talaimanar was the start of the shortest ferry service to India through the Indian port of Rameswaram. The rosters featured runs of 2,009 miles in 102 hours or 2,432 miles in 118 hours. Although often worked in multiple they were able to handle these workings singly. Operating costs were half that of the steam locomotives. After just over two months in service D27 suffered a traction motor fault (a broken banding wire). It was moved to the Workshops for attention but whilst being lifted a chain broke allowing the locomotive to fall and strike the floor. Although the damage sustained appeared superficial it was later discovered that the alignment of the engine mounting had been compromised which led to a crankshaft failure late in July 1935, with the locomotive taken out of service, never to run again in Ceylon. At the end of May D28 sustained a cracked cylinder block and was taken out of service, D28 would run until late July when it sustained the crankshaft failure. With both locomotives now sidelined and the trial period over they were shipped back to Armstrong Whitworth for an uncertain future. Armstrong Whitworth offered to sell the two locomotives for GBP15,000 each with spares, but the Ceylon Government turned down the offer. Whilst in Ceylon both locomotives had worked about 60 days each, travelling a combined total of 34,327 miles, with average fuel consumption between 1.1mpg & 1.2mpg. Although the Ceylon Government Railway paid a fixed charge per train mile amounting to 75% of the equivalent steam costs, the diesels did in fact operate at half the cost of steam traction. After repair at Scotswood the pair lingered unsold for several years until purchased by the BAGSR in Argentina in 1937/38 (see the Argentina page). The article above indicated that the railways in India were showing interest in the development of diesel traction, and were looking for large locomotives to trial on the longer distance workings. On the hopes of an order the two 880hp locomotives mentioned above were constructed with the 5ft 3in gauge North Western Railway in mind. 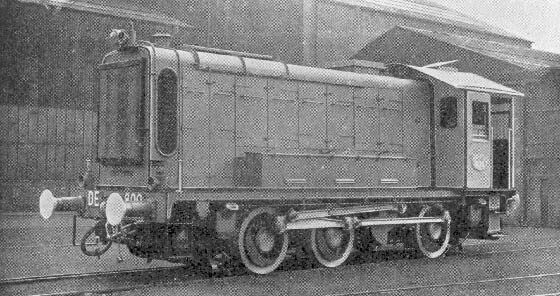 However an immediate order was not forthcoming, but during April 1934 an order was received from the Indian Railway Board for the North Western Railway for two locomotives but larger and more powerful than the two 880hp locomotives built by Armstrong Whitworth. The two locomotives were each powered by an Armstrong-Sulzer 8LD34 engine producing 1,200hp at 630rpm, but for the NWR it was derated to 984hp. Laurence, Scott and Electromotors provided the main generator and Crompton Parkinson the four axle hung, nose suspended, force ventilated traction motors. The power units featured welded steel crankcases and cast iron cylinder blocks. The wheel arrangement was 1A-Co-2, the driving axle located under the radiators was actually mounted on a bogie, this reduced the length of the rigid wheelbase and gave similar characteristics in which ever direction it was being driven. Following normal practice an Armstrong-Saurer 6BXD 110hp auxiliary engine was used to power the auxiliary equipment. Purchase price for each locomotive was GBP26,000. They were to be used on the arid Karachi - Lahore route working the Sind mail trains and heavy goods trains. Their working environment would be a tough one, operating from sea level to 1,000 feet with tropical humidity and shade temperatures reaching to 120F. The double cab roof was specially ventilated, whilst teak was used to line the cab. The North Western Railway No.332 poses for its portrait for use in an advert featuring Crompton Parkinson electrical equipment. This view clearly shows the unusual bogie featuring one non-powered axle with 3ft diameter wheels and one axle with 4ft diameter driving wheels. A factory portrait of No.332 awaiting shipment to India, no doubt this is the view which was used for the stylised view above. After completion they were transported from Elswick to Karachi on one of the specialised ships operated by the Belship Company, the ship having been built by Armstrong Whitworth and powered by Sulzer engines. They arrived in Karachi during the first week of September 1935. The locomotives were numbered 332 & 333 and quickly went out on trials with their intended use being in multiple on the 750 mile Lahore - Karachi route handling trains up to 600 tons to a maximum of 65mph. Problems very quickly occurred concerning flashovers affecting the generators and traction motors. Even worse, whilst locomotive 333 was being hauled dead the reverser drum closed due to excessive vibration - this caused the motors to become generators leading to extensive damage to all the motors. Two were so badly damaged they required complete rewinding. The shops at Karachi were not able to handle the repairs so in the first week of October 1935 332 hauled 333 and one coach to Lahore, a journey of 752 miles, with 332 consuming 400 gallons of fuel. Whilst at Lahore 332 continued with further trials, hauling lighter trains on shorter runs. The flashovers continued, most noticeably when speeds exceeded 50mph. Problems were also experienced with other electrical components including the relays, however modifications were able to resolve these issues. The main generators were unstable at 850 volts, information gathered about the makers bench tests revealed they were carried out at fixed voltages and were not run for long periods at maximum service voltage. The trials ended in the middle of June 1936. Late in 1936 the power equipment was removed from the locomotives and returned to Scotswood for analysis and modification. Work had started on the electrical equipment modifications but unfortunately the Diesel Traction Department closed shortly afterwards with no further work being carried out on the equipment. The North Western Railway released the manufacturers from their contract, with the mechanical portions of the locomotives being sold for scrap locally in India. The mileage worked by the two locomotives were No.332 - 5,102 & No.333 - 1,387. Plan and elevations of the NWR locomotive. Throughout the time spent in India the Sulzer engines gave no significant problems, after their return to Scotswood they remained un-used and were eventually sold to the BBC for stationary use at their Rampisham Down establishment. The generators were returned to Laurence Scott and Electromotors, Norwich, they were both still in use at their workshops as late as 1975. 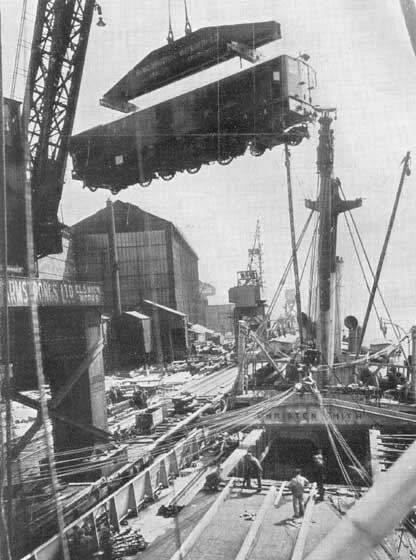 Dockside on the Tyne as NWR No.332 is loaded onto a Belship's vessel for delivery to India. The Bombay, Baroda & Central India Railway (also known locally as the Bloody Bad & Can't Improve Railway) acquired one Armstrong Whitworth shunter during October 1936. 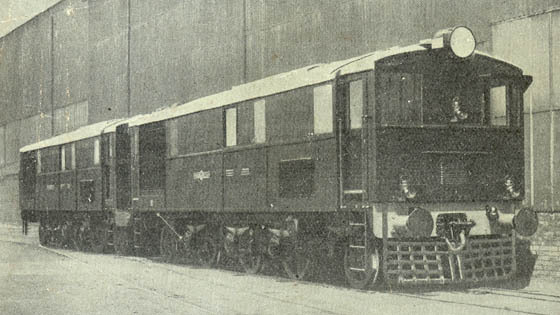 It was similar to the ten built for the LMSR, but was lighter due to their 16 ton axle loading. It was of the familiar 0-6-0 wheel arrangement with jackshaft drive, built for the broad gauge (5' 6"). It was however derated to 350hp from the 400hp applied to the LMSR units. Air filtration was improved because of the Indian environment, also assisted by slight pressurization of the engine/generator compartment. The locomotive was shipped through Glasgow for delivery to Bombay, where it arrived during the first week of October 1936. Regular service commenced in the Bandra Hump yard, Bombay later the same month. It replaced a 2-8-0 120 ton tender steam locomotive. On level track the diesel shunter could move 2,000 ton trains. The locomotive was still at work in the 1950's. The British Internal Combustion Locomotive 1894 - 1940, Brian Webb. Armstrong Whitworth A Pioneer of World Diesel Traction, Brian Webb. Page updated May 18th 2011.